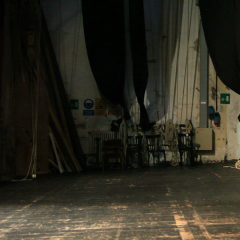 Elena Bellantoni is a video artist and a visual researcher. She lives between Rome and Berlin where in 2008 she founded a space for Art and investigations between different practices 91mQ art project space. She is a cofounder of Platform Translation Research Group. Elena graduated at Rome University “La Sapeinza” then she got an MA in Visual Art at WCA University of Arts London. 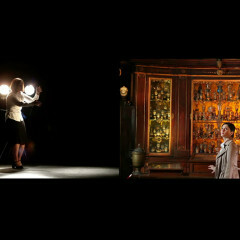 She showed her work in different video festivals and exhibitions: at the Volksbuehne Fatzer Kurzfilmkino in Berlin a video festival curated by Bruno Di Marino, she exhibited in Rome at Museum Mlac, Weisser Elephant Galerie in Berlin, at The Pan Museum in Neaples, at the Tenth Barcelona Contemporary Art Festival BAC!, Video in Progress 3 Photon Gallery in Slovenia and in many others places. In 2008 Elena Bellantoni got a scholarship from GAI and the Italian Minister for Young People to go to Santiago De Chile to produce a video work. During the 2012 she exhibited: at Kunstraum Kreuzberg Bethanien in Berlin with In Other words curated by Paz Guevara and Elena Agudio, at Macro Museum in Rome exhibition Re-generation curated by Ilaria Gianni and Maria Licata. Her next solo project will be at Muratcentoventidue Gallery in Bari curated by Eleonora Farina. Looking for EB throws the viewer into an uncomfortable emotional world, in which the sound is urgent, the detailed definition of the objects, the movements of EB and almost frightened at the same time wary. Spielplatz "in German means" playground. "A job that insists on the "inner landscape" as a representation of childhood memories that come to life in the "hidden" in the theater: the back of the stage, the dressing rooms, the stage machinery ..
Ich bin du bist .. is a work on the meaning and value of language, in this case the language of love . A circular work on the couple's relationship in which a man and a woman reveal their thoughts in front of a confessional in the Roman countryside . The scene ' seemingly bucolic , but with a leaden sky that portends the worst, begins with a declaration of love infinite almost cloying. The room takes up with a long shot the scene where the confessional acts as an interface between the two lovers , when the field narrows close-ups revealed here by the look thoughts unacknowledged . The couple will totally change language register , now there is' a battleground in which the two totally contradict the thoughts of the original piece . Where is the truth ' ? As in a party game between the I and the you you're everything and ' lawful , everything becomes its opposite . The video begins and ends on the same shot , the circularity ' obsessive and endless game of roles and thoughts brings us back to a conflict that belongs to all of us : the relationship with the others. A surreal action inside the London Underground "London Bridge". 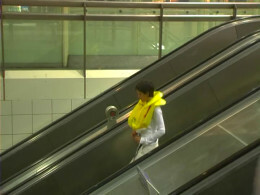 A small and tiny figure wearing a yellow Life Jacket is trying to walk on the escalator against the current. 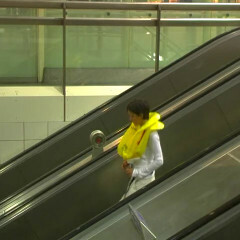 A phisical and symbolical experiment into the city and its transit's zones.